Hedge and cornfield mazes have become staples of the Halloween season, and horror fans can't resist venturing into anything reminiscent of Stanley Kubrick's The Shining. But fans of Netflix megahit sci-fi/horror series Stranger Things may want to plan a trip to someplace Hawkins-adjacent (specifically Lafayette, Indiana) this fall for a taste of The Upside Down that's unlike anything we've ever seen. The folks at Exploration Acres seasonal pumpkin patch used a ton of imagination and a splash of advanced technology to construct a Stranger Things themed maze that boggles the mind. Even Jack Torrance would flinch at this sucker! "The area of the 20-acre maze is equivalent to about 15 football fields and the available paths total over 10 miles, making this the largest attraction Exploration Acres has attempted to date." "This year, new technology allowed us to plant the maze design like an inkjet printer, dropping seeds into the precise design we imagined." As for what we can expect when Stranger Things returns to Netflix, we got our first insight in the form of a retro commercial for Starcourt Mall, the newest hotspot in Hawkins. The only characters we see from the show are Steve (played by Joe Keery) and newcomer Maya Thurman-Hawke (daughter of Uma Thurman and Ethan Hawke) whose character https://variety.com/2018/tv/news/stranger-things-season-3-new-character-maya-thurman-hawke-1202715637/|Variety described as "an 'alternative girl' bored with her mundane day job." Well, we now know what that is: The duo are employees of Scoops Ahoy Ice Cream Shop! (I'm an Orange Julius man, myself.) It's an embarrassing time capsule for Mall Rats of the 1980s-definitely the kind of artificial, plastic landscape evil is apt to lurk within. "This thrilling Netflix original drama stars Golden Globe-winning actress Winona Ryder as Joyce Byers, who lives in a small Indiana town in 1983 - inspired by a time when tales of science fiction captivated audiences. When Joyce's 12-year-old son, Will, goes missing, she launches a terrifying investigation into his disappearance with local authorities. As they search for answers, they unravel a series of extraordinary mysteries involving secret government experiments, unnerving supernatural forces, and a very unusual little girl." 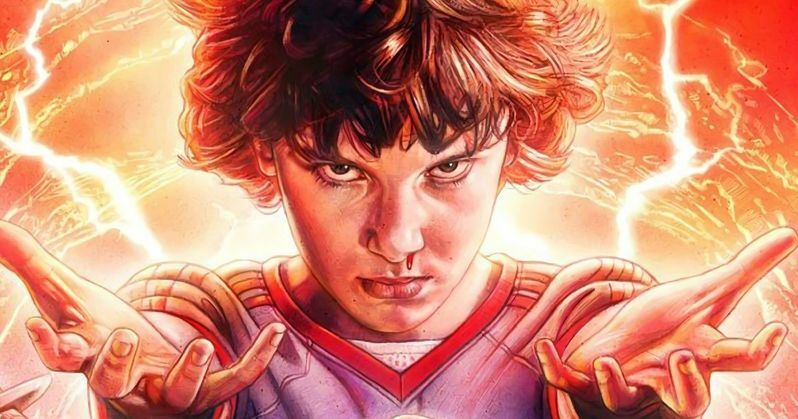 Stranger Things was launched by Matt and Ross Duffer 2016; it was an instant hit propelled by a wave of nostalgia and is at least partially to thank for the resulting Stephen King Renaissance that began in 2017. In addition to Thurman-Hawke, other Season 3 newbies will include Jake Busey and Cary Elwes with an elevated role for Priah Ferguson who was a consistent scene-stealer in Season 2 (where she played Lucas' little sister Erica). If you're more interested in Exploration Acres than Stranger Things, the site is opened from September through October and, in addition to mazing around, you can camp, hike, bike, even fire a "Corn Cannon" and get in a game of paintball.